Peptide (C)GSNQTEPYYDMTSN, corresponding to amino acid residues 30-43 of rat SSTR2 (Accession P30680). Extracellular, N-terminus. Homology Mouse - identical; human, pig - 12/15 amino acid residues identical. 1. Anti-Somatostatin Receptor Type 2 (extracellular) Antibody (#ASR-006), (1:200). 2. Anti-Somatostatin Receptor Type 2 (extracellular) Antibody, preincubated with the control peptide antigen. Immunohistochemical staining of rat hippocampus using Anti-Somatostatin Receptor Type 2 (extracellular) Antibody (#ASR-006). 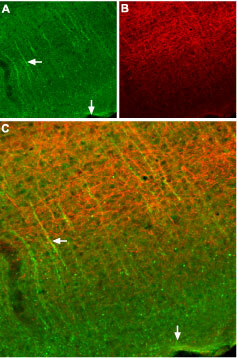 A. SSTR2 appears in neural processes (green) that are perpendicular to dentate granule layer (arrow). B. Staining of axons with mouse anti-Neurofilament 200 (NF200, red). C. Confocal merge of SSTR2 and NF200 images suggests that SSTR2 is not present in axons that run through the granule layer and hilus, but rather in neuronal dendrites that ascend toward the dentate hilus (arrow). Immunohistochemical staining of frozen mouse cortex sections using Anti-Somatostatin Receptor Type 2 (extracellular) Antibody (#ASR-006), (1:100). A. SSTR2 appears in neural processes (green, horizontal arrow) that are perpendicular to the cortical surface (vertical arrow). 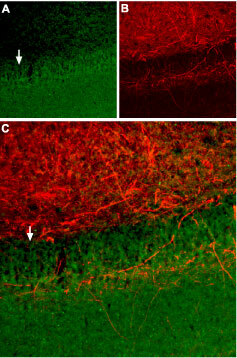 B. Staining of axons with mouse anti-Neurofilament 200 (NF200, red) appears mostly in the deep layers. C. Confocal merge of SSTR2 and NF200 images suggests that SSTR2 is not present in axons that run in the deep layers, but rather in neuronal dendrites that ascend toward upper layers of cortex (vertical arrow). Cell surface detection of SSTR2 in intact living human colorectal adenocarcinoma (HT-29) cells. A. Extracellular staining of cells with Anti-Somatostatin Receptor Type 2 (extracellular) Antibody (#ASR-006), (1:50), (red). B. Merged image of A with live view of cell. Hofland, L.J. and Lamberts, S.W. (2001) Ann. Oncol. 12, S31. Fombonne, J. et al. (2003) Rep. Biol. Endocrinol. 1, 19. Slooter, G.D. et al. (2001) Br. J. Surg. 88, 31. Schulz, S. et al. (2002) Gyn. Oncol. 84, 235. In general, SSTR2 is the most common SSTR subtype found in human tumors, followed by SSTR1, with SSTR3 and SSTR4 being less common. Alomone Labs is pleased to offer a highly specific antibody directed against the N-terminal domain of the rat SSTR2. Anti-Somatostatin Receptor Type 2 (extracellular) Antibody (#ASR-006), can be used in western blot, immunohistochemistry and immunocytochemistry applications. It has been designed to recognize SSTR2 from mouse, human and rat samples. Anti-Somatostatin Receptor Type 2 Antibody (#ASR-002). This antibody recognizes a different epitope and thus can also be used as a control for detecting SSTR2.